Whopper Sacrifice, un invento de Burger King. Por cada 10 amigos que vos borrabas de Facebook, Burger King te regalaba un Whopper. Puede sonar tonto, pero segun la web Whopper Sacrifice, se terminaron 233.906 amistades. Para tratar de frenar la baja de amistades, Facebook enviaba mails a los amigos eliminados diciendo "te cambiaron por un decimo de hamburguesa". Burger King sacrifico la campaña y ahora queda la duda si sobraban amigos o hamburguesas. Sea como fuere, la noticia llego al New York Times. 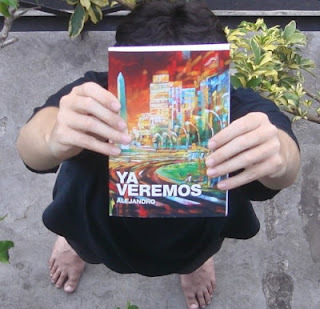 Mas abajo, la nota completa. A PERSON could go mad trying to pinpoint the moment he lost a friend. So seldom does that friend make his feelings clear by sending out an e-mail alert. It's not just a fact of life, but also a policy on Facebook. While many trivial actions do prompt Facebook to post an alert to all your friends -- adding a photo, changing your relationship status, using Fandango to buy tickets to "Paul Blart: Mall Cop" -- striking someone off your list simply is not one of them. 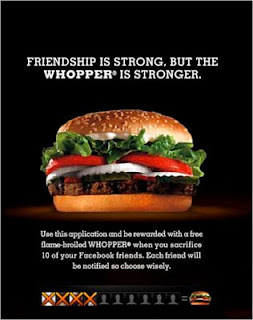 It is this policy that Burger King ran afoul of this month with its "Whopper Sacrifice" campaign, which offered a free hamburger to anyone who severed the sacred bonds with 10 of the friends they had accumulated on Facebook. Facebook suspended the program because Burger King was sending notifications to the castoffs letting them know they'd been dropped for a sandwich (or, more accurately, a tenth of a sandwich). The campaign, which boasted of ending 234,000 friendships, is history now -- Burger King chose to end it rather than tweak it to fit Facebook's policy -- but the same can hardly be said of the emerging anxiety it tapped. As social networking becomes ubiquitous, people with an otherwise steady grip on social etiquette find themselves flummoxed by questions about "unfriending" people: how to do it, when to do it and how to get away with it quietly. "If someone with more than 1,000 friends unfriends me, I get offended," said Greg Atwan, an author of "The Facebook Book," a satirical guide. "But if someone only has 100 friends, you understand they're trying to limit it to their intimates." Mr. Atwan, a recent graduate of Harvard (where Facebook got its start), recommends culling your friend list once a year to remove total strangers and other hangers-on. Keeping your numbers down gives you more leeway to be selective about whom you approve in the first place, he said. Of course, not all unfriendings are equal. There seem to be several varieties, ranging from the completely impersonal to the utterly vindictive. First is the simple thinning of the herd, removing that grad student you met at a party two years ago and haven't spoken to since or that kid from middle school you barely remember. These were the people whom Steven Schiff, a news assistant at Vault.com, a career services Web site, sacrificed to get his Whopper. "I found there were quite a few people on my list that I'd never even spoken to, much less been close friends with," he said by telephone. Mr. Schiff, 25, said he experienced only the slightest guilt at eliminating those people. While he didn't feel the need to write to them individually to explain things, he did use his personal blog to address them en masse. "Let's be honest here, questionable Facebook friend," he wrote. "We've been keeping you around all this time because we'd just feel bad if you ever found out that you got the ax. It's just, well, up until now nobody offered us a Whopper in exchange for your feelings." This was just the sort of sentiment that Burger King and its advertising agency, Crispin Porter & Bogusky, were aiming to evoke when they set up the campaign. Burger King decided that it would do the talking for this article rather than its agency and delegated the task to Brian Gies, a vice president of marketing who said he was not a member of Facebook and therefore had not participated in the "Whopper Sacrifice." Mr. Gies explained the marketing team's thinking about Facebook. "It seemed to us that it quickly evolved from quality of friends to quantity," he said, "which was interesting to us because it felt like the virtual definition of a friend became something different than the friends that you'd want to hang out with." From there, Mr. Gies said, the team started wondering: "Do you really want to have all these people knowing what you're up to and what you're interested in? We wanted to be part of that conversation and part of that solution, and 'Whopper Sacrifice' was born." Facebook, which now has more than 150 million members, has clearly been built on the back of the culture of oversharing. Many members broadcast the mundane details of their lives through a "status update" feature, which lets people -- nay, encourages them -- to describe the contents of their lunch or the virulence of their bronchitis. Even in this environment, however, deleting friends does not generate a notification of any sort, leaving members to discover they've been unfriended only when they find they no longer have access to someone's profile. It can be a jarring experience, especially considering that the person who dumped you at some point either requested you as a friend or accepted your request (on Facebook, that is how friends are made). But members understand that such selective discretion is critical to the social-networking ecosystem. "We believe that relationships change, and users should be able to have the friend list respect those changes without the pressure of a public notification," Ms. Barker said. Nor does Facebook care to be a party to what might be called punitive unfriending, banishing someone from your network for violating one or more of your personal rules of conduct. Perhaps someone annoys you by posting an obsessive number of status updates, or expresses himself in a way that you consider obnoxious? Those were the excuses that Ehren S., a former co-worker of mine who apparently unfriended me sometime this past spring, offered up recently for giving me the digital heave-ho. "I believe it was based on a passive-aggressive update of yours to which I sighed, kinda shook my head and pressed 'delete from friends,' " she confessed by e-mail. "I find negativity a bit tiresome and don't have the patience for it." Fine. Though forgive me for pointing out that Ehren, who asked that I not use her full name, initially tried to fib her way out of the awkwardness by saying she did it for a Whopper. Last week the question of friendship decorum grew so vexing for Henry Blodget, the former securities analyst whose loud crash from Merrill Lynch helped lead him to a career as a blogger, that he publicly begged Facebook for a solution. Apparently, being barred from the securities industry doesn't keep a guy from being inundated with friendship requests from complete strangers. "I've occasionally thought about trying to solve this problem by 'unfriending' everyone who isn't actually my friend, but that's too horrible to contemplate," Mr. Blodget wrote on his Web site, Silicon AlleyEast Coast Insider, on Sunday. "I don't know how I'd get through the day if Facebook kept sending me e-mails about how people I didn't even know were 'unfriending' me." Mr. Blodget asked Facebook to develop new friendship levels that would let users sort their acquaintances by degree of separation. He suggested categories like " 'personal friends' or 'work friends' or 'extra special friends' or 'BFFs' or 'friends you want to hear meaningless trivia about all day long,' " and implored, "Please give me the ability to put friends in these groups without telling them I have done so." On Facebook, as in life, no unfriending is as fraught with pitfalls as the one you really mean. Rachel Heavers, a stay-at-home mother in Arlington, Va., found that out when she angrily deleted a lifelong pal, "Marie," in December during what she described as "a hormonal moment." "Our first kids were born two months apart, and we are both pregnant with our second, which are due three days apart," she said. The two had a falling out in December after Marie (her middle name) insisted that Mrs. Heavers's daughter had swallowed one of her earrings (she hadn't). The friends wound up arguing in the emergency room, and later agreed to take a break from each other. Mrs. Heavers soon tired of seeing Marie on Facebook. During an emotional late-night moment, she clicked the "remove" button, expecting never to speak to Marie again. "Now I really, really regret it," said Mrs. Heavers, who is starting to reconcile with Marie but afraid to send out a new friendship invitation to her on Facebook: "I'm not sure if she's even noticed yet that I've unfriended her."